To continue just the once more with the Pre-65 Scottish – a Swedish owned Royal Enfield that looks almost recognisable (forks excepted!) having a shower. 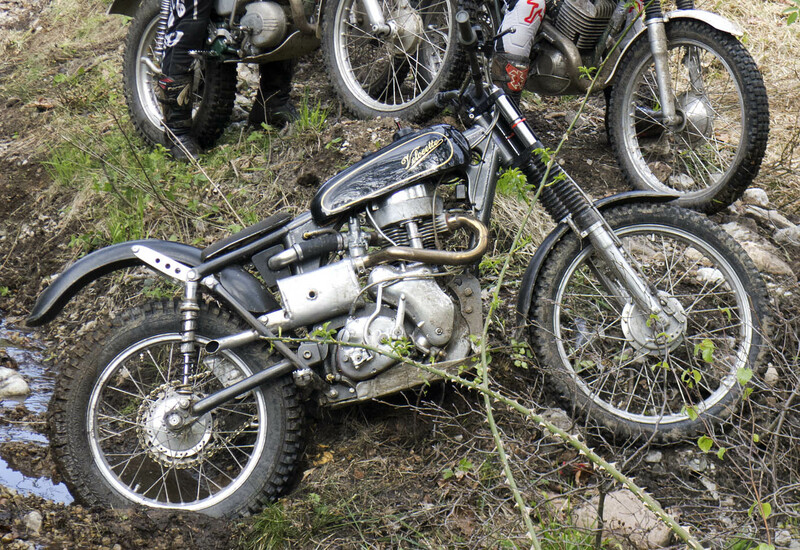 A 500cc at that, amongst all the other 350cc Enfields competing. Francis-Barnetts used to be resplendent in a green livery too and the Ariel below is flanked by a pair of them. Naturally these never saw the Fanny-B factory either but it’s the thought that counts. Both infinitely better than any original F-B for the purpose. The sharp eye will spot a “James” in the background too. Its just lovely to see and hear all the old and not-so old stuff that is ridden here. Virtually all British (English!) too. Here’s a view of folks awaiting their turn at the next section. Velo, Matchless and a “Bantam” behind. Just joyous! 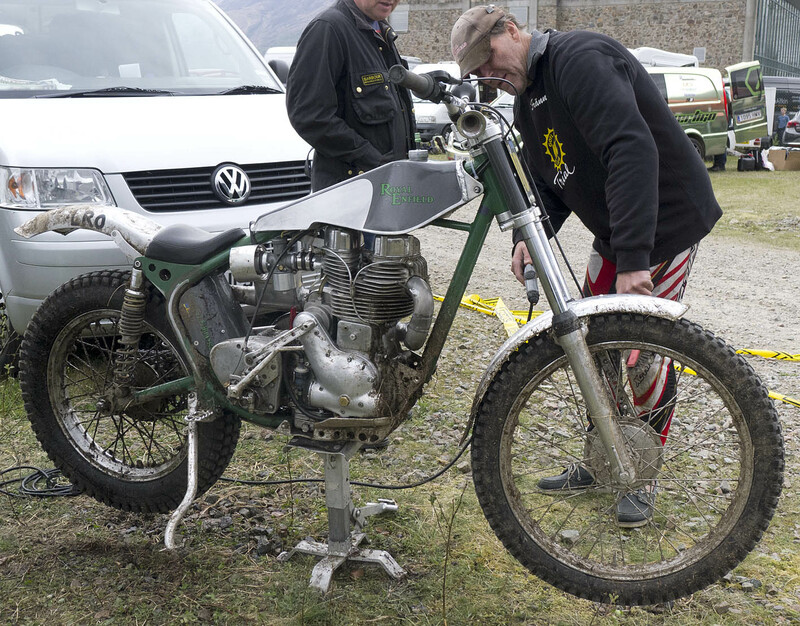 As a good European I have to show this delightful wee 240cc JAWA too…. …and that’s about it for this year’s Pre-65. Back to Human-power for MY 2-wheel-ing. Regrettably……….. 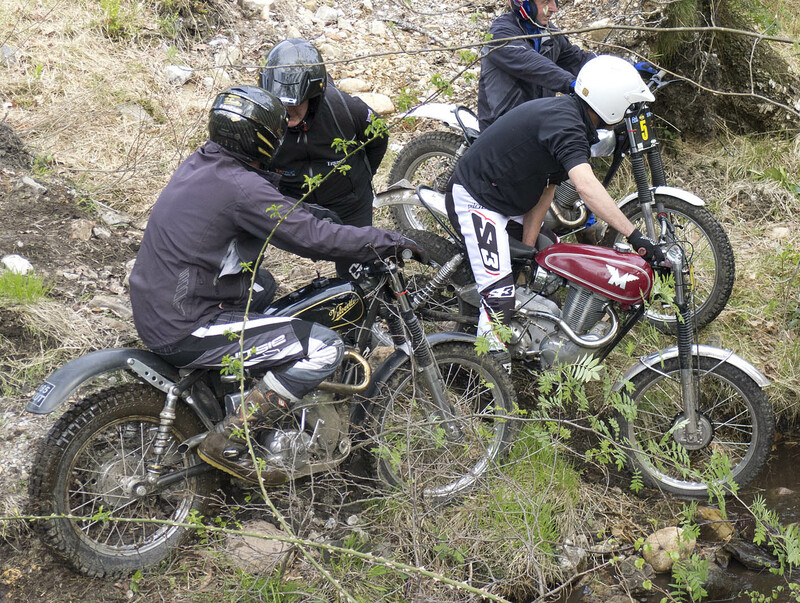 The Past isn’t what it used to be…..
To continue in the “Motorcycle Trials in Days of Yore” mode – a trip up to Kinlochleven this weekend to view the Scottish Pre-65 2-Day Trial. 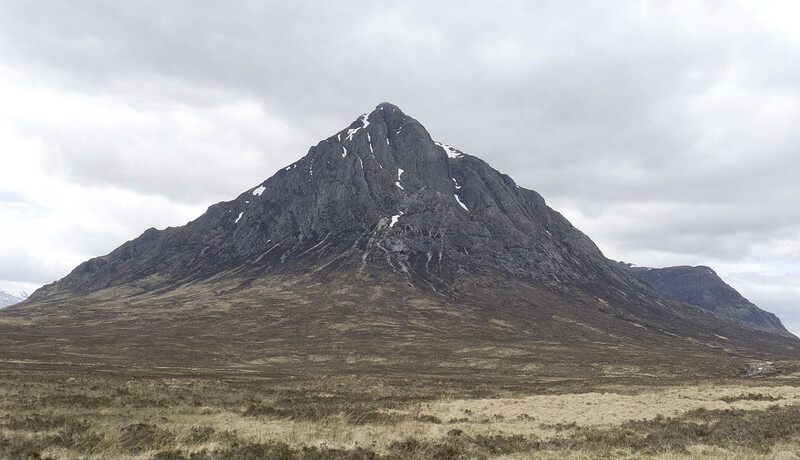 Passing the Great Big Buachaille on the way. Looking a bit broody on Friday but not as terrifying as the day long ago when Stan press-ganged me up it. 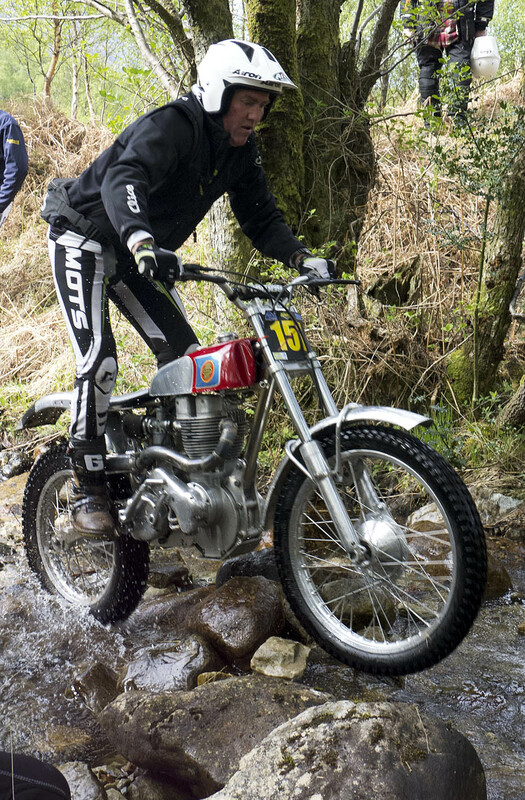 The interesting thing about the Pre-65 trial is all the qualifying Pre-1965 bikes that are so different to anything made before 1965! 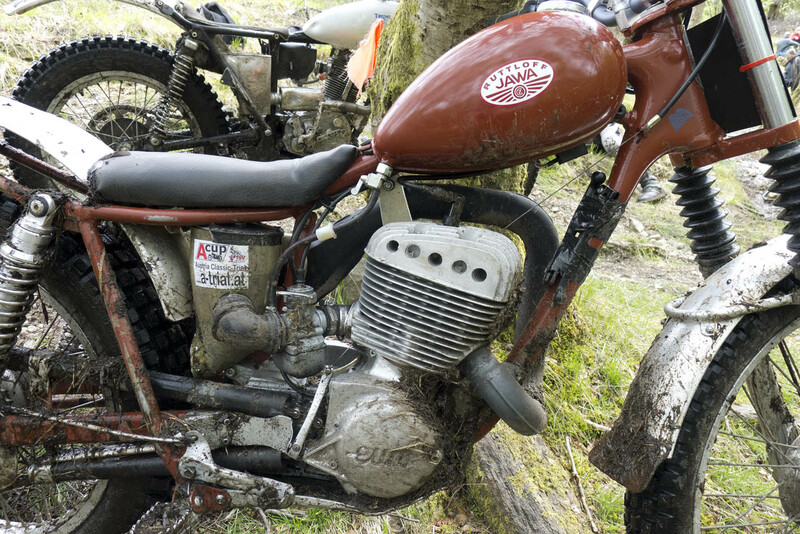 A Velocette Trials Bike? Impossible! – but here it is. (and there were two). It’s a Velo ENGINE anyway. Ariel-ish frame. Norton forks ( but what’s inside them?) Burman gearbox and clutch and a belt primary-drive = Velocette! 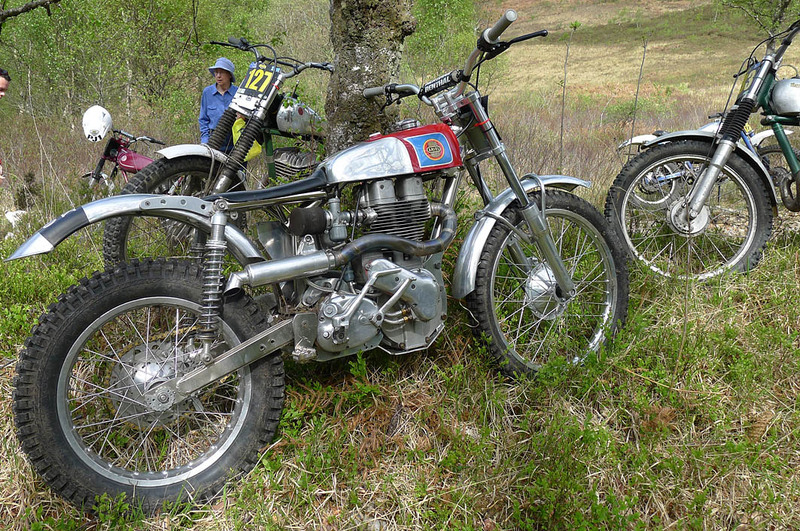 A true classic of the Scottish – the 500cc Ariel HT in action. Of course very little of this lovely thing ever saw the inside of the Ariel factory. The engine and gearbox castings certainly but very little else. Nobody at Norton would recognise the “Norton” forks either I suspect. But the point is the bikes look fabulous, sound the same and are far lighter and infinitely better than the factory original. 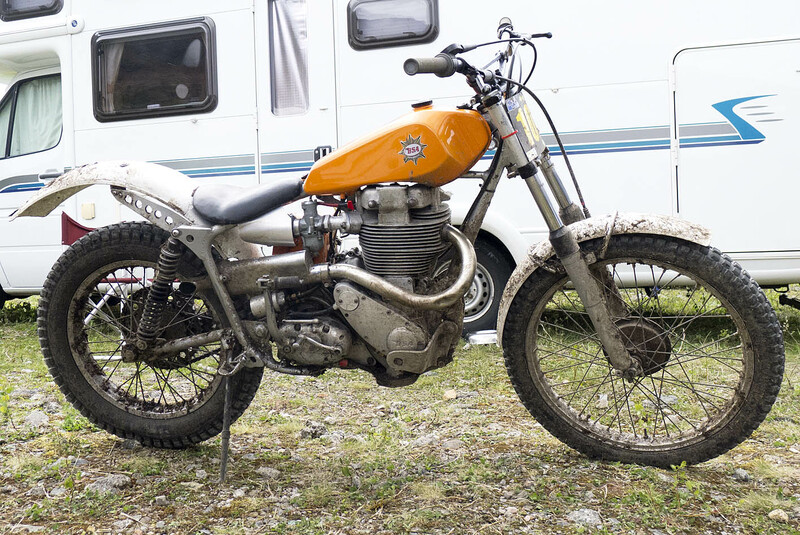 My own favourite British bike is the BSA Gold Star but the big Goldies were never cut out for trials – although the BSA works team did use the early BB model until something a bit more suitable came along. The 250cc BSA C15. There were a good number of THEM this weekend too. But there was a most excellent new-build oldie but Goldie at Kinlochleven. Oh! Great was my delight to see THIS! This BSA seems to be heavily indebted to Royal Enfield cycle-parts and probably much else besides. It’s a 350cc DB32 model although when I asked Mike it’s rider what engine size it was, his voice dropped a bit and he confided “390”. So, no crossed rifles trademark stamped on THAT piston! Here’s another post-trial pic. I LOVE this! I was so enthusing about this beast that Mike offered me a shot – which I politely refused. With my present level of practice and incompetence, that might just have been as terrifying as climbing the Buachaille. A Sunday Morning’s walk along the foreshore at Silverknowes last week. 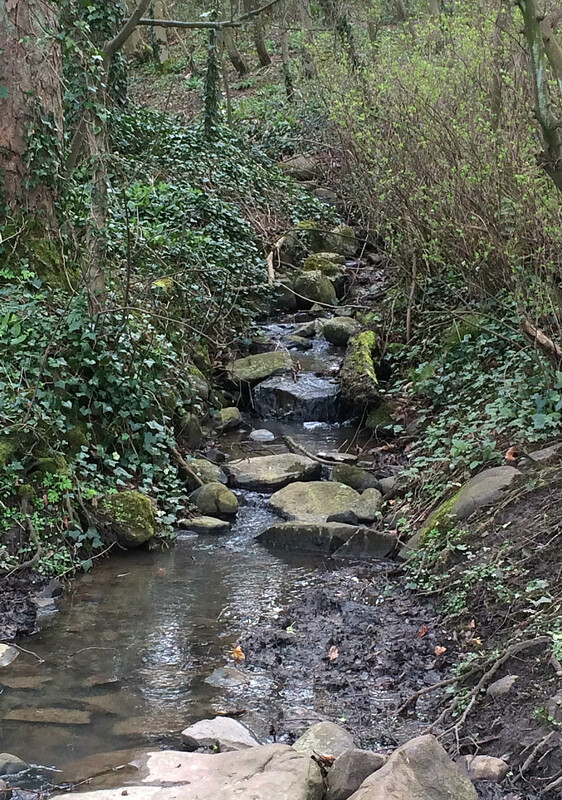 I stopped to take this shot as this is a stream that takes me back to my days of Trials riding with pals and of the skills we would try to improve on by riding up this feet-up. It’s a bit more overgrown than in those days of yore but the real tragedy is that whilst we would ride to this and have a couple of hours practicing in the stream-bed, to do so nowadays would bring down all manner of legal censure. i.e. We’d all get the jail! 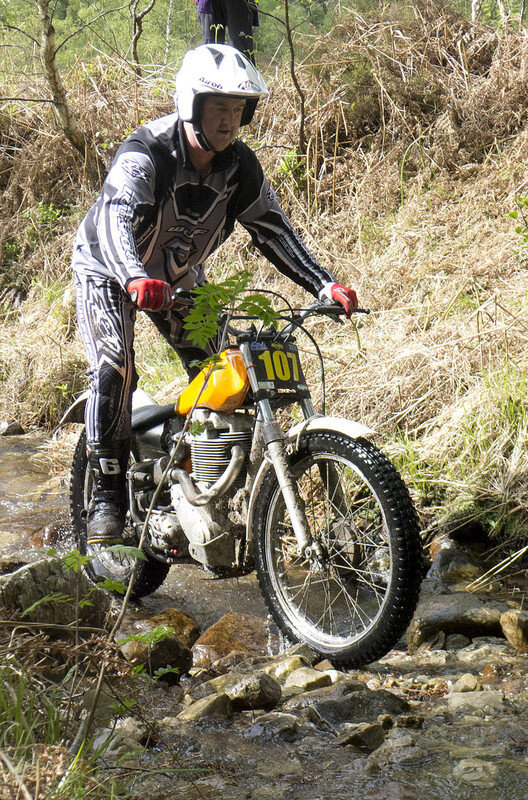 Stan’s Greeves Anglian and all manner of Bultaco’s. But sad that nobody can or would attempt such a thing nowadays. Interesting too that a half-mile further East is an enclave of Transits and Caravans drawn up in a defensive circle on the public grasslands.